With next Thursday (maybe weds or friday) looking like CAVE SWALLOW weather in the southern Great Lakes, I thought I'd throw down some of the meteorological patterns I have observed that were associated with Cave Swallow events... The models are still a bit variable, so I may wait a few days before throwing out the formal rarity alert. (But heads up - Tue-Wed-Thur-Fri-Sat are looking good for various reasons). To begin - I have a rough theory that CASW do not behave as other vagrants do. They seem (to me) to be intentionally migrating north over a period of several days to weeks, potentially even waiting out poor weather before making the next jump north. A similar behaviour would be the spring migration of Broad-winged Hawks - where you need good weather over a period of several days (to weeks) to bring the birds from Mexico north to the Great Lakes. In this scenario it is entirely possible to have amazing hawk migration weather on April 14th, but no Broad-winged Hawks - simply because they aren't close enough. Then the next day (on seemingly poor weather) - they're close enough now to start filtering past. Similar to hawk migration - the weather not only plays an important part in bringing CASW to our area, but is perhaps equally as important in bringing those CASW to a location where birders can detect them. In my local area (Hamilton, ON) - we can have great CASW weather, but if a gentle "lake breeze" picks up out of the NE - we can't find any CASW. I presume they are flying past inland, at height - and with no concentrated flight path... When the wind finally goes south (and pushes them against the shore) - boom. There they are. There seems to be little concentration effect with this weather, so I've yet to see anyone get big CASW #'s from this pattern - but it also seems to be bonkers for bringing mega rare passerines along with it - so worth keeping an eye out for! 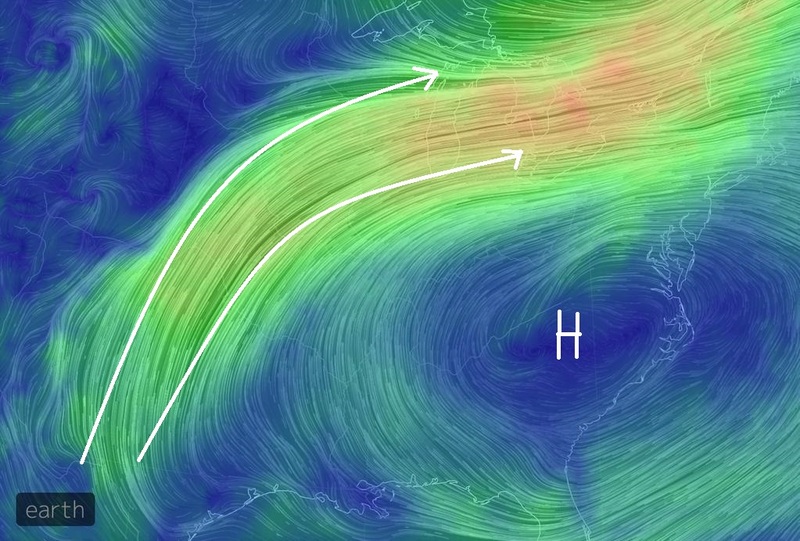 Meridional Flow is the opposite of Zonal Flow - where you have large kinks in the jet stream and contrasting air masses. As the air masses mix, there are various ways the warm air masses and cold air masses interact. The best (in this scenario) are Anafronts - where rain falls inside the cold part of the frontal boundary and not in the warm sector. This is an extreme example - but not the warm front far to the N (and the associated low) - with the far reaching cold front. 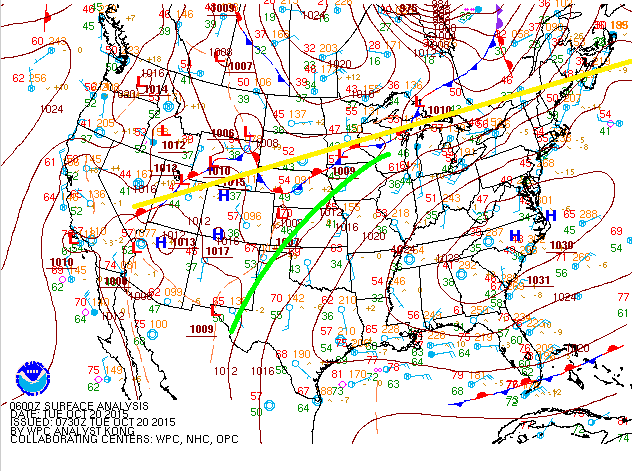 I've drawn in green where the precipitation would be (guess) and the yellow line indicates the direction of the southerly air. I should also note that this storm did not act alone - 7-10 days earlier there was excellent weather to push CASW "close enough" to take advantage of this weather on Oct 26... 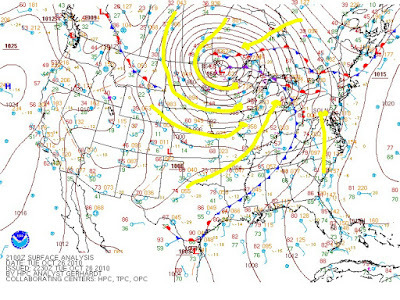 The S winds are strongest closest to the frontal boundary. If it were raining there (katafront) - then the strongest winds would be useless for Swallow migration! This setup also favours birders, who can position themselves at concentration points along the lakeshores and wait for them to fly past. I'm also not terribly sold on this setup bringing OTHER vagrants in the fall in any great numbers. Sure, something like an austral migrant might be mixed in - and mega rares turn up anytime - but it doesn't seem as good as the other two discussed here. 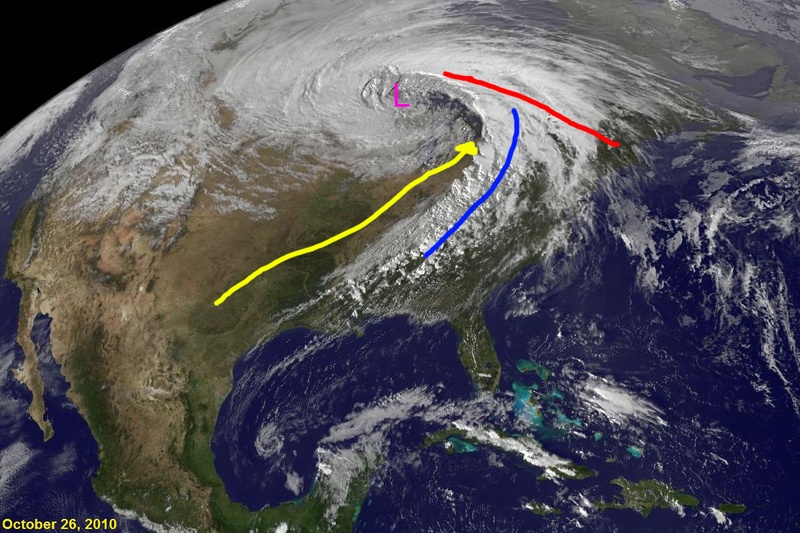 In the largest of storms, sometimes you get an occluded front, followed by a warm seclusion that serves to really strengthen the system. In October 2010, we saw the most powerful extratropical cyclone ever (inland) in North America - and it brought a TON of Cave Swallows with it. IV - now a pocket of warm air is broken off from the surface air- the cyclone has "spun up" and pressures fall and winds pick up big time. So there we go! 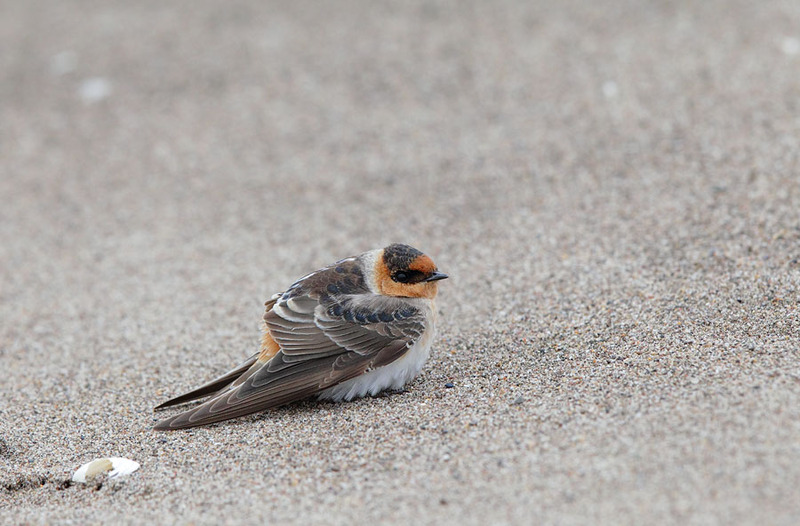 Three different weather patterns that have brought Cave Swallows to the Great Lakes. 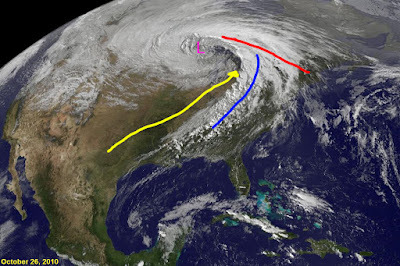 Zonal flow, Anafronts and exceptional Extratropical Cyclones with a Warm Seclusion. Perhaps new setups are yet to be discovered? These are also the weather that BRINGS the Cave Swallows to our area. FINDING Cave Swallows is another weather-dependant exercise all in itself! Nice Brandon. 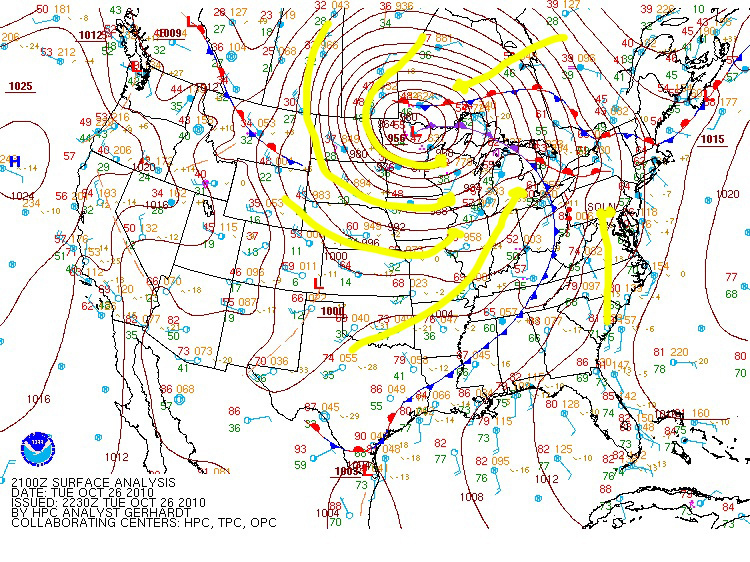 The common theme here is a SW flow from the Tex-Mex region up to the Great Lakes (or beyond). This is Phase 1 of the east coast Cave Swallow setup. Phase 2, in the ideal setup, is a NW flow behind a cold front that pushes those scattered interior birds to the coast, where they stack up and filter their way back south. Pretty simple vector stuff. That combo results in the largest CASW numbers along the northeast US coast. In addition to the favorable weather scenarios, I think that the summer's CASW reproductive success might be another important factor. Most specimens or well-photo'd individuals have been HY birds. Stands to reason that a good breeding year in the source region would leave lots of birds in the pool to draw from, while poor breeding years might not result in many birds for us even if the weather setup is favorable. I think it may be interesting that an anafront may be the best weather to bring CASW, but that a zonal flow setup may be worse for CASW, but better for other passerine rares? Also, I'm betting on Thursday/Friday bringing at least a few CASW! 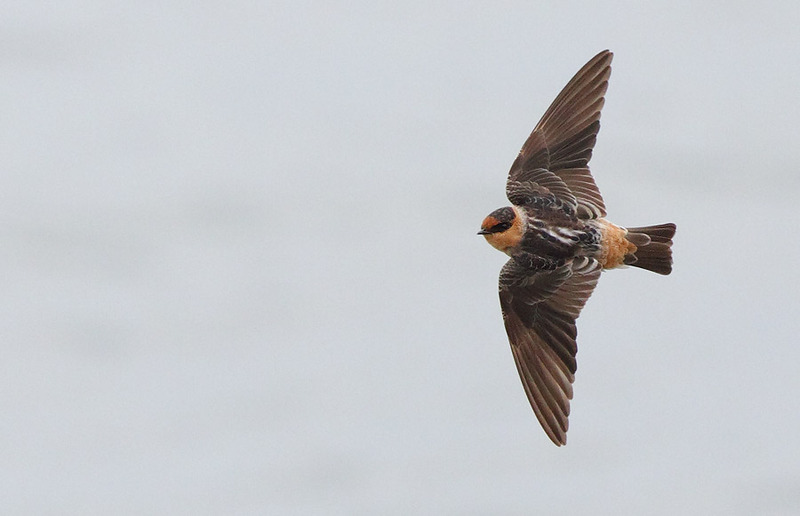 Given the region they're hailing from, I wonder if Cave Swallow breeding success might be more vulnerable to severe drought than anything else. Just a thought.